Caterham development driver and Strakka Racing man Will Stevens took a controlled opening Formula Renault 3.5 race of the season, while chaos reigned around him. Series debutantes Roberto Merhi (Zeta Corse) and Pierre Gasly (Arden) filled out the podium respectively. The Briton benefitted even before the race when poleman Carlos Sainz Jr failed to get away from the dummy grid thanks to an electrical issue, effecting the gearbox. With two of his protagonists cleared, Stevens stormed passed the slow starting Will Buller and Luca Ghiotto take a stunning lead ahead of Merhi and Gasly. Stevens instantly began to pull out a gap ahead of his rivals, but this was annulled when the safety car was called at the start of lap two. In a battle over 7th and 8th, Marco Sorensen exited the Parabolica alongside Jazeman Jaafar on the start / finish straight, with the former moving over Jaafar, pitching the Malaysian into the outer wall. Meanwhile Sorensen flipped violently and slid along his roll hoop bar, before hitting the pitwall hard, spraying debris across the circuit. Thankfully both emerged unscathed. The stewards would later give Sorensen a five-place grid penalty for tomorrow’s race. When the race went back to green on lap five, Stevens disappeared from the fight; the gap growing each time around. By lap ten, it was 2.7s; lap 15, it was 3.7s; then 5.7s on lap 20. The only time the Strakka Racing man appeared to ease up was on the final lap, by which point, the field had long since been defeated. Merhi, meanwhile, was far busier for a time. Returning to single-seaters for the first time since 2011, the Spaniard had to work hard to keep ahead of the aggressive Gasly; however once composure was gained, Merhi drew away while Gasly came under increasing pressure from Nikolay Martsenko. Gasly came under increasing pressure from Martsenko, with the pairing coming side-to-side through the Rettifilo chicane on lap 14; however the Russian made it stick one lap later to move passed Gasly, only for the Frenchman to take it back when Martsenko ran off track at the second Lesmo half-a-lap later. The dirt on Martsenko’s tyres quickly destroyed his pace, allowing Buller to catch the Russian in the final tours. Buller’s poor start had dropped him to 9th place, but he pulled a few back following the Sorensen / Jaafar incident and another one when Ghiotto pitted. A move on Roman Mavlanov on lap 11 gave Buller the space and time to attack Martsenko, with the Northern Irishman taking 4th from Martsenko on the final lap. Oliver Rowland rescued 6th for Fortec after winning a long battle with Marlon Stockinger, while Rowland’s Fortec teammate Sergey Sirotkin did enough to take 8th. 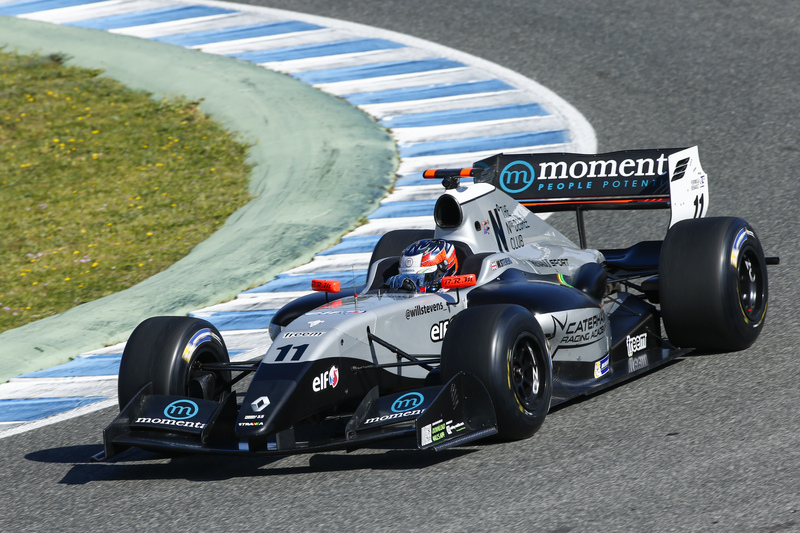 Zoel Amberg finished 9th for AVF and Meindert van Buuren closed out the top ten for Pons Racing.